This podcast has been to Hicksville and Coconino, so why not Fairfield County, CT? 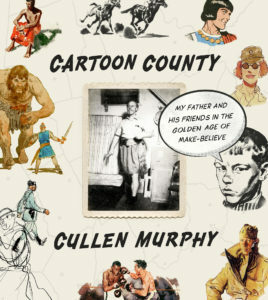 Cullen Murphy‘s new book, Cartoon County: My Father and His Friends in the Golden Age of Make-Believe (FSG), tells the story of Prince Valiant cartoonist John Cullen Murphy and the community of cartoonists, illustrators and comic-book artists who settled the southeastern corner of Connecticut in the ’50s and ’60s. Cullen & I talk about the confluence of factors that led to that community and his goal of preserving that golden age in this book, his realization that “cartoonist” was not a normal job for one’s dad, his own cartooning aspirations, what writing Prince Valiant with his father taught him about storytelling, how his upbringing around cartoonists affected how he worked with illustrators as a magazine editor, why his father stuck with realism and never worked in bigfoot style, and what Cartoon County taught him about himself & his family. Give it a listen! And go buy Cartoon County ! Cullen Murphy is the editor at large at Vanity Fair and the former managing editor of The Atlantic Monthly. His books include Are We Rome? : The Fall of an Empire and the Fate of America , and God’s Jury: The Inquisition and the Making of the Modern World . For twenty-five years he collaborated with his father, the illustrator John Cullen Murphy, on the comic strip Prince Valiant. He lives in Massachusetts with his family. His new book is Cartoon County: My Father and His Friends in the Golden Age of Make-Believe . Credits: This episode’s music is Nothing’s Gonna Bring Me Down by David Baerwald, used with permission from the artist. The conversation was recorded at the Vanity Fair offices (!) on a pair of Blue enCORE 200 Microphones feeding into a Zoom H5 digital recorder. I recorded the intro and outro on a Heil PR-40 Dynamic Studio Recording Microphone feeding into a Cloudlifter CL-1 and a Mackie Onyx Blackjack 2×2 USB Recording Interface . All processing and editing done in Adobe Audition CC . Photo of Mr. Murphy by me. It’s on my instagram.